Core control classes are defined in the package org.apache.click.control. This package includes controls for the essential HTML elements. Extended control classes are provided in the Click Extras package org.apache.click.extras.control. Click Extras classes can contain dependencies to 3rd party frameworks. A subset of these control classes are depicted in the figure below. ActionLink - provides an anchor link that can invoke action listeners. Field - provides the abstract form field control. Form - provides a form control for processing, validation and rendering. Submit - provides an input type submit control that can invoke action listeners. TextField - provides an input type text control that can invoke action listeners. 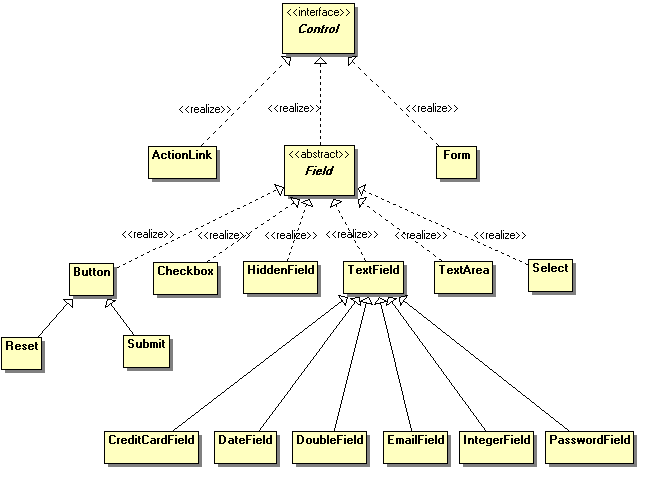 The control classes are designed to support subclassing for customized behaviour. All control fields have protected visibility and have public accessor methods. You can also aggregate controls to build more complex controls. For example the CreditCardField uses a Select control to render the different credit card types.